#5 - Lift, Throw, Swing! Everywhere you turn today there is a news story about the increase of the average person’s weight and the resulting decline of their health. According to the World Health Organization, in 2014 3% of the world’s adult population was considered obese and 9% of the population was considered overweight. These are numbers that have essentially doubled from 1980 to 2014. To cater to this population, there is no shortage of new diet plans and franchise gyms on every street corner. “Low carb”, “Eat like a Caveman”, “Cardio Kickboxing” – you name it, if there is a business angle for selling to people that think they need to lose weight, there is already a book and an infomercial about it somewhere. Diets are usually an exercise in self deprivation that have very poor long term success rates. Some of the more popular fad diets also recommend avoid certain nutrients that can even be harmful in the long run. Gym memberships are usually expensive and once the novelty of the gym routine wears off, can be very difficult to stay motivated for. The one thing both have in common is once the strategy fails, you usually end up feeling poorly about yourself. 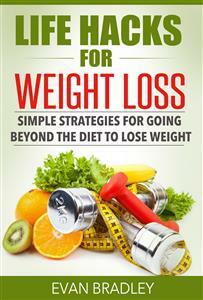 It doesn’t need to be THAT difficult to lose a modest amount of weight however. There are certain lifestyle ‘hacks’ that can be made to your everyday routine that can shave off calories everyday. Consider this: in order to lose one pound of body weight a week a person must create a caloric deficit of 3500 calories, which is the equivalent of 500 calories a day. Following a handful of these hacks a day can easily cut out 500 calories a day for you. Incorporating many of them can lead to more than that! If you choose to change your diet or add a gym membership on top of the hacks, your results will grow exponentially! This tip should be one of the first things that anyone learns for losing weight. If you want to be healthy, and you want to slim down — drink plenty of water. Even those who are completely satisfied with their physical condition should follow this tip. In order to stay hydrated and lose weight, you cannot simply drink soda or juice. Those types of drinks have a lot of calories in them, and other things that might not be beneficial for your health. Yes, juice does contain the goodness of fruit, but is also a lot of acids in there, which are not great for bones. What is the best drink for weight loss? Water! It is easy to get your hands on, as long as you have access to a faucet to drink from. If you don’t like the idea of drinking that type of water, buy natural spring water. It is not a waste of money at all, because it’s much healthier than the alternatives. This is a wonderful little trick, and it’s very easy to start using immediately. If you want to feel fuller while eating smaller meals, drink water before you eat. This will help to fill up your stomach so that you don’t feel the need to eat as much. It will also help to improve your digestion so that your body can properly process your food.